Yesterday, I mentioned the US News and World Report's great article on five health apps that they think would be great for health conscious iPhone users. 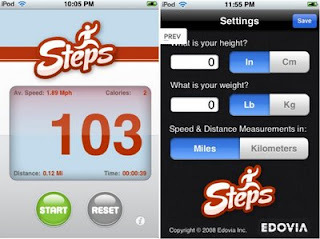 Steps (use this link to go to the website - the other link takes you to the iTunes App Store) is a very simple pedometer. Maybe the accuracy of Steps does not warrant $2. It would be more palpable at $1, or free. After downloading and installing on my iPhone, I started walking around my house. It result? It was off by 50% when I held it in my hand. Then I went to the website and it recommended that "To ensure the best accuracy, it is recommended to put your iPhone or iPod touch in your pants' front pocket or wear it at your waist. Steps also needs your device to remain unlocked." So after putting in my pocket, and doing the same thing, the result was much closer to the actual number of steps. In one test, it was off by 12 steps out of 60 steps. Then at a faster face, it was about 10% short of 50-ish steps I took. In my next test, tried it on my lateral trainer (think Susan Summers). It was not accurate at all. But then I'm not sure it was made for that. I had my mom tried it on her iPhone and margin of error was 5%. In my short jog around the block, I recorded an accuracy of 85%. There is an update to version 1.1 on the iTunes App Store. I wonder if it'll be accurate now for early adopters of the app. Conclusion: I bought it at $2 strictly to review a health app that I think has a lot of potential. Anyway, for convenience sake, it is a good buy. Just grab it off the app store and off you go within a couple of minutes. If you're looking for something more accurate, I hope Edovia will work on it some more and offer it as a free update to version 1.0 adopters. One thing a user said in the review was that the iPhone was not able to allow using Steps at the same time with iTunes. I was able to but I had upgraded to version 1.1. My mom loves it after using it for a walk already. Do I recommend buying this? Maybe it's not accurate enough to be worth $1.99 but let's hope there are forthcoming upgrades from the publisher. But it is accurate enough to get rough estimates based on my test results. I'll post more information when I go for a 5-mile run later this week. Besides, if it short changes you, is it not a plus that you have to run or walk longer to reach your goal? Note: A true pedometer is coming from Apple. It's just something we can expect from Nike/Apple. I doubt Apple will punish us for being iPhone or Touch adopters. Then again, I can see Steve Jobs say "just get an iPod nano if you want Nike+".